While the tragic story of Nicole Brown Simpson is extremely well documented, much less is known about the other woman in O.J. Simpson's life. The landmark murder case, thrust back into the spotlight thanks to a five-part documentary and an Emmy-nominated TV miniseries, but neither had shed any light on the former Buffalo Bills superstar's first wife, Marguerite Whitley. On Thursday, the FX hit The People v. O.J. Simpson: American Crime Story, gathered 22 Emmy nominations, including Outstanding Limited Series. ESPN’s recent near 8-hour documentary, O.J. : Made in America has also quenched the public's thirst for The Juice. Read: O.J. Simpson's Trial: Where Are They Now? Simpson's 11-year marriage to Whitley was not covered in the series but their time as a couple would shape and change the football star forever. How did Simpson Meet Marguerite Whitley? Simpson met his future wife at San Francisco’s Galileo High School, when she dated his best friend, Al “AC” Cowlings. Cowlings would later become known as the driver in the infamous Bronco chase in the days following the murders of Nicole Brown Simpson and Ron Goldman. According to a 1994 New York Times article, Cowlings and his girlfriend were having issues as a couple and he asked O.J. to talk to her. The discussion ended up turning into a relationship. Marguerite broke up with Cowlings and began dating Simpson. She was 16 at the time. Cowlings was reportedly enraged but he eventually cooled off and stuck by Simpson’s side. Cowlings would follow the Simpson to the City College of San Francisco then to USC where they played football together. Simpson caught the interest of many universities for his athletic ability. He was ready to attend Arizona State and, according to reports, was at the airport to leave for the school when Marguerite persuaded him to do another year at City College. He would later go down in history as one the best players in USC's history. Simpson, then a freshman at USC, married his girlfriend when she turned 18 in 1967. “We were such kids, it was fun. We didn’t have to answer to our parents anymore. We could party and stay out all night. It wasn’t a crazy wildness,” she told Barbara Walters in 1995 in a 20/20 interview, her last known public appearance. They had three children together, Arnelle, born in 1968, Jason in 1970 and Aaren in 1979. Aaren tragically died in the family swimming pool just weeks shy of her second birthday. Thanks to his efforts on the field at USC, Simpson won the Heisman Trophy in 1968 and would go on to become the No. 1 draft pick for the NFL the following year. He was recruited by the Buffalo Bills. The couple spent a majority of their marriage in Amherst, New York, while he played for the Bills for eight seasons. While her husband was a boisterous football star, Marguerite was shy and private. “There were times in our marriage as in all young couples, we were both bullheaded. We were testing the ground with each other. We had young children. We had an amount of money that no one told us how to invest it. There was an immaturity on our part,” she told Walters in 1995. As Simpson’s popularity grew, so apparently did his ego and infidelity. In a 1968 interview with Look magazine, Marguerite said of her husband: "He was a beast. He was pretty horrible. If there were other fellows who wanted to talk to girls, he'd make them stay away. He'd been a terrible person, right on the edge of trouble." While Simpson’s marriage to Brown was peppered with problems, including various calls to police about domestic disturbances, the ex-football star and his first wife claim they had no violent issues. But in February 1995, retired LAPD officer Jim King spoke to Inside Edition about a domestic violence call at the Simpson home in West Los Angeles during the mid-1970s. “[Marguerite] indicated that OJ had punched her, had kicked her, had choked her, had forced her to the ground. He never denied touching Marguerite to the contrary he said, he should have not touched her,” King claimed. Both Simpson and his first wife have denied that the football star ever hit his wife. Marguerite told Walters that she knew of his infidelities during their marriage. By the mid-70s, she reportedly told her lawyers to get divorce papers ready but she never followed through. Toward the end of the decade they had separated once before getting divorced in 1979. “She lent an element of stability to him — mother, homemaker, things like that," her former lawyer Harry F. Fain told The New York Times in 1994. "Then he becomes a celebrity and the marriage begins to fail." 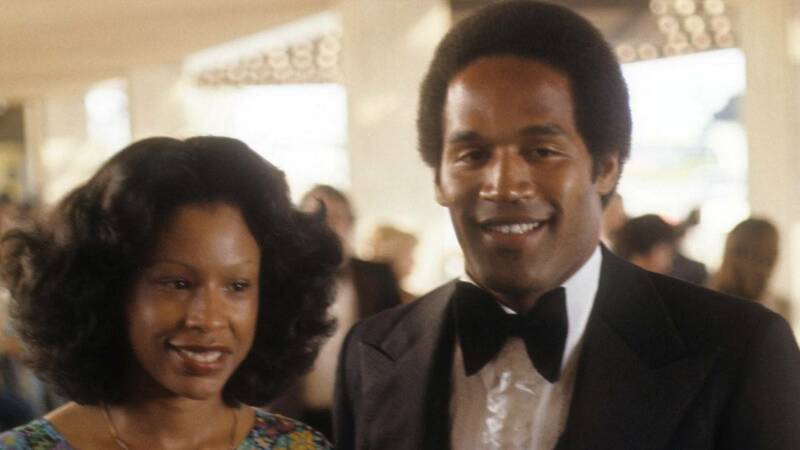 By 1977, Simpson met Nicole Brown, who was working as waitress in Los Angeles. In the 2007 book, If I Did It, Simpson wrote that his marriage to his first wife was on “shaky ground” when he had met Brown. Marguerite said she knew of Brown and their relationship when she spoke to Walters. Following their divorce, Marguerite and her former husband continued to have a rocky relationship. She accused him of not fulfilling financial obligations. She sued him and by 1986, they settled out of court. Marguerite married twice after her divorce from Simpson. In 1986 she married transit supervisor Rudolph Lewis but they divorced in 1991. A year after her brief marriage to Lewis, she married furniture sales representative Anthony Thomas, who accompanied Marguerite to her interview with Barbara Walters in 1995. She and her friend, Ronald Goldman, were found stabbed to death outside her Los Angeles home in June 1994. It wasn't long before her ex-husband became the prime suspect. During “The Trial of the Century,” Marguerite believed her ex-husband was innocent. She told Walters she did not believe he was capable of killing anyone, especially his former wife. She accompanied their children nearly every time they appeared in court. Marguerite was asked to testify in the 1995 murder trial, but her lawyer Carl Jones argued she should not be called as a witness because "the witness has no relevant material testimony to offer." As the trial raged on TV screens, she kept a low profile. Read: From the Gloves to the Bloodied Clothes, What Happened to Evidence in O.J. Simpson's Trial? Since her ex-husband’s acquittal in 1995, Marguerite has rarely been seen. Her children with Simpson have also kept a low profile. Recent reports have noted that it's even unclear if she and Thomas are still married. Social media profiles suggest she continues to use her maiden name. Calls to an address in her name went unanswered. Simpson’s Rockingham estate, which he and his first wife once called home, was demolished after it was purchased by an investment banker shortly after Simpson was ordered to pay $25 million in damages to the Brown and Goldman families following a civil suit. O.J. Simpson currently sits behind bars in a Nevada prison for a 2009 armed robbery conviction; he is up for parole next year when he will be 70 years old. In one of the closing scenes of O.J. : Made In America, an audio recording of Simpson speaking from inside jail is played. The stark hiss of an audiotape fades as the former football great and former American hero declares: "I feel totally empty ... please remember me as a good guy. Please."